Joseph Henry Blackburne (1841–1924), nicknamed "Black Death", dominated the British chess world during the latter part of the 19th century. He learnt the game at the relatively late age of 18 but quickly went on to develop a chess career that spanned over 50 years. At one point he was number two in the world with a string of tournament victories behind him but he really enjoyed popularising chess by giving simultaneous and blindfold displays around the country. 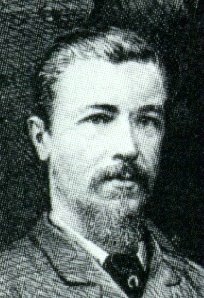 Joseph Henry Blackburne was born in Manchester in December of 1841. He first learnt how to play draughts as a child and it wasn�t until he heard about Paul Morphy�s exploits around Europe that he switched to playing chess. He joined the Manchester Chess club around 1860 and learned a lot about endgame theory from Bernhard Horwitz, who had been appointed the resident chess professional in 1857. At first Blackburne worked in the hosiery trade but after improving rapidly at the game during the 1860s he decided to turn chess professional. By the 1868-69 season he had won the 2nd British championship after beating the current holder, Cecil de Vere, and he was duly regarded as England�s best player. For the next 20 years Blackburne toured the globe playing the greats of world chess. He was regularly in the top 5 of the world rankings and performed well in many international tournaments. He was 1st= with Wilhelm Steinitz in Vienna, 1873, although he lost the playoff (-2); 1st in London, 1876; 1st= with Berthold Englisch and Adolf Schwarz in Wiesbaden, 1880; 1st in Berlin, 1881, where he finished 3 points ahead of his great rival Johannes Zukertort; 1st= with James Mason in Belfast, 1892 and 1st at the London tournament of 1893.
in 1887 (+5, -1, =7) and he performed similarly against Isidor Gunsberg in the same years - winning in 1881 (+7, -4, =3) but losing the return in 1887 (+2, -5, =6). The 1876 match against Wilhelm Steinitz was held at the West-end Chess club in London and it was considered at the time to be an unofficial world championship match. The stakes were £60 a side with the winner taking all. This was a considerable sum of money in Victorian times - £60 in those days would be roughly equivalent to £4,000 in today\\\�s money. Blackburne made most of his money from touring the country giving simultaneous exhibitions and blindfold displays. Indeed he even visited the North-east of England in 1889 to help promote the newly formed Teesside Chess Association. Blackburne visited the area for two simultaneous displays and a blindfold event. He charged 1/- for a simultaneous game or 2/6d to play him blindfold and he proved to be virtually unbeatable, winning 29, drawing 2 and losing only one of the simultaneous games. In the blindfold he won 7 and drew 1 with 0 losses. His fondness for drinking whisky at the board once led him to down an opponent�s glass. Shortly afterwards, the opponent resigned, leading him to quip, "My opponent left a glass of whisky en prise and I took it en passant". Blackburne held that drinking whisky cleared his brain and improved his chessplay, and he tried to prove this theory as often as possible. It was for simultaneous events like the above that Blackburne invented his famous Shilling gambit. He would charge amateurs a shilling to play him and more often than not he would despatch them within 7 moves! By the 1890s Blackburne was reputedly playing over 2,000 games a year in simuls and he had even travelled abroad to countries like the Netherlands, Australia and New Zealand to give exhibitions. However he still had time to marry twice and with his second wife, Mary Fox, he had a son. In addition he played top board for the British team in 11 of the Anglo-American cable matches which commenced in 1896 and in the first six matches he recorded a score of 3½-2½ against the top American, Harry Pillsbury. the play-off for the title. Earlier in the same year he had competed in his last major international tournament in St Petersburg, where he beat the up-and-coming Aaron Nimzowitsch, but by now he was concentrating on writing his chess column for The Field, a position he held up until his death in 1924 at the age of 82. Joseph Henry Blackburne is an icon of Romantic chess because of his wide open and highly tactical style of play. His large black beard together with his aggressive attacking style earned him the nickname of "der Schwarze Tod" (the Black Death, referencing the plague of the same name) after his performance in the 1873 Vienna tournament. In 1881, according to one retroactive rating calculation, he was the second highest-ranked player in the world. He was especially strong at endgames and had a great combinative ability which enabled him to win many brilliancy prizes but he will be best remembered for his popular simultaneous and lightning displays which captured the imagination of the general public who flocked to watch him. Mr Blackburne�s Games at chess, which he published in 1899, has been recently reprinted by Moravian Chess. It contains over 400 of his games, around 20 problems composed by him as well as a short biography. This article is based on the article Joseph Henry Blackburne from the free encyclopaedia Wikipedia and stands under the GNU-Licence for free documentation. In the Wikipedia a list of the authors is available.